Bryan Litz, Ballistician for Berger Bullets, is the author of the book Applied Ballistics for Long-Range Shooting. Before joining Berger, Bryan was a missile design engineer working with the U.S. Air Force. An NRA High Master, Bryan also happens to be one of the country’s top long-range shooters. Bryan (aka “bsl135″ in our Forum) has written many ballistics programs and technical papers dealing with long-range flight dynamics of projectiles. Bryan has recorded some very impressive match performances recently. 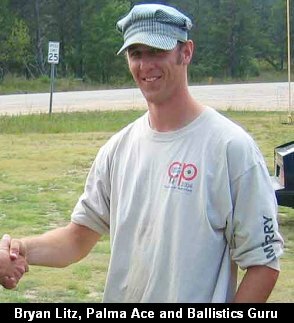 At the 2008 NRA National Championships at Camp Perry, Bryan beat 258 other competitors to win the Palma Individual Trophy Match. Bryan shot a remarkable 450/26x, not dropping a single point. Share the post "Palma Competition — Shooter's Eye View on Video"
Trinidad State Junior College (TSJC) has launched an advanced Third-Year gunsmithing program at the school’s Trinidad, Colorado campus. This program augments Trinidad State’s respected two-year gunsmithing school, established in 1947. For the past 63 years, TSJC has built a world-wide reputation for the excellence of its program. Companies involved in the firearms industry have been quick to hire TSJC’s gunsmithing graduates. The new third-year program is an elite school, open to the top 25 percent of graduates from all gunsmithing schools in the nation. Development of the third-year program began with conversations between the college and representatives from Brownells about the need in the industry for gunsmithing graduates who are not only accomplished gunsmiths, but who also understand the firearms business, including retail sales, inventory control, counter sales, customer service, and dealing with vendors and management. Pete Brownell, shared his vision for this program to reflect real world employment in a working gun shop environment. 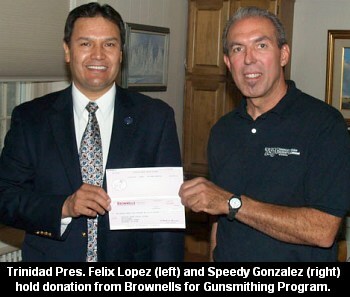 Brownells provided $250,000 in funding for facilities remodeling plus needed equipment for the new retail-repair facility, christened the “Brownells Trinidad American Firearms Technology Institute”. The first class of third-year students will experience the hard work and challenges of starting up a small business under the guidance of TSJC gunsmithing instructor Speedy Gonzalez. Gonzalez, a member of the Benchrest Hall of Fame, spent 30-plus years building precision rifles before coming to TSJC to “pass on his knowledge of gunsmithing to the next generation of gunsmiths”. “Our intent is to open and operate a real-life gun shop with third-year students who will provide top quality gun repair, parts, and services for gun owners and collectors and hunting and shooting sports enthusiasts. We will offer retail, repair, blueing, reloading, and we even plan to do some light manufacturing”, said Gonzalez. The shop will maintain regular hours to serve local customers, including shooters from the nearby NRA Whittington Center in Raton, NM. Additional ‘Gunsmithing Business Practices’ and ‘Gunsmithing Shop Management’ modules will be taught year-round by experts directly involved in the industry. Gunsmiths already employed and even gun shop owners/managers can sign up for modules of particular interest. In addition to the original two-year Gunsmithing Program and the new third-year program, TSJC offers short-term summer courses designed for anyone interested in learning gunsmithing. To learn more about gunsmithing programs at Trinidad State Junior College, visit www.TrinidadState.edu, or call Lynette Bates at (719) 846-5650. Share the post "Advanced Third Year Gunsmithing Program Opens Doors"